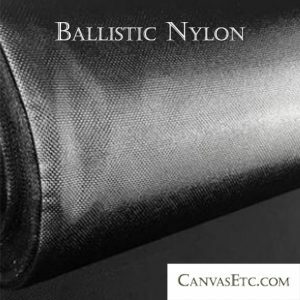 Ballistic Nylon - What is it? | Learn about its Uses & History | Canvas ETC . We are constantly asked about the difference between nylon and “ballistic” nylon? While a succinct answer might reference the high abrasion resistant basket weave of this durable nylon, the longer answer might surprise you. Created by DuPont during World War II, Ballistic nylon refers to a very specific type of nylon fabric that has been engineered for unrivaled abrasion resistance and maximum durability. In fact, its original intended purpose was for the protection of aircraft personnel as an anti-fragmentation ballistic jacket for the military, guarding them against bullets, shrapnel, and yes… ballistic impacts (which is how the name of this type of fabric garnered its well-described name). Many-and-multiple layers of the thick fabric were laminated together to help stop the exploding shrapnel and fragmentation. 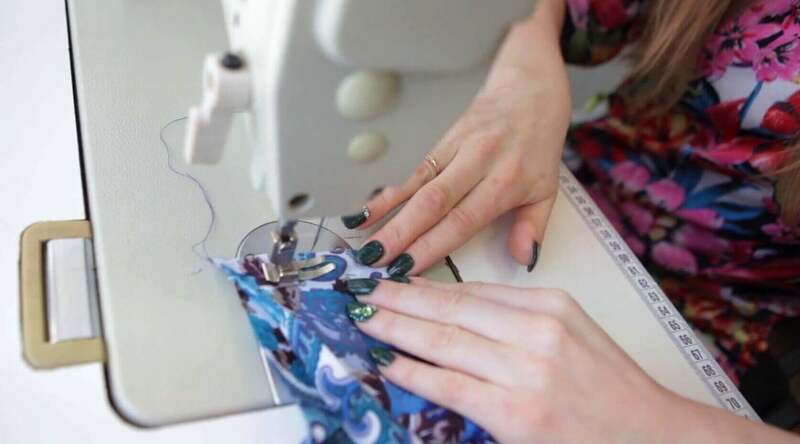 Ballistic nylon has proven largely ineffective for this purpose, however, though still highly regarded as a very tough and highly functional material. By the late ’70s the military had upgraded their armor to a lighter weight Kevlar® and a more effective ceramic plate technology – technology that could actually stop bullets and shrapnel. It is still used in the military, but has expanded for many other applications than for bodily protection against fragmentation. In today’s modern age, ballistic nylon is most commonly used in applications and end-uses in gear that endure consistently repetitious use and abrasion. During the 80’s, and when many new manufacturers of heavy-duty luggage entered the market, the term “ballistic” became a very marketable term, and consumers readily embraced this idea of a ballistic material with military utility. The heavy weave, known strength, and slick finish have ensured its popularity even today, even though it is a single layer fabric. As there is no need for adding additional layers for the purpose of protection, and as it has been replaced by Kevlar for this purpose, it no longer maintains its true “ballistic” properties and capacity. Typical applications include luggage, duffel bags, briefcases, pet beds, work wear, chairs, backpacks, luggage, horse blankets, and many different covers and custom cases. This rugged material with its high abrasion resistance attribute is ideal when hauling super heavy loads. It is a must-have fabric material for any product that needs reinforced high wear areas. Ballistic nylon backpacks are one of the most popular end-products made, and would rival only the droid turbo ballistic nylon case as most used. Additionally, a “ballistic weave” is a particularly tight and dense 2×2 basket weave (which is the most common weave for ballistic material). This maximizes the fabric’s tear resistance in all directions and extreme durability! The large denier of the individual nylon threads also effectively resists abrasion. 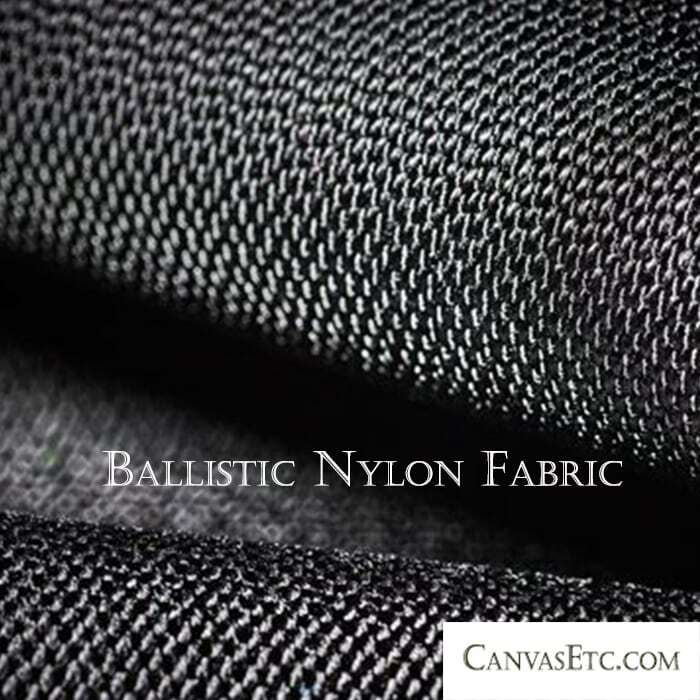 Ballistic Nylon Fabric is engineered using a very high-denier nylon thread, which is typically 1000D and higher. 1680d ballistic nylon and 1050d ballistic nylon are very popular, and probably the most widely used. Many people often confuse the ballistic nylon feature by its denier thread weight, but this not not entirely accurate. It’s the 2×2 basket weave which turns the thread into the material itself which is the notable differentiator. Our 1050 Denier Ballistic material is our high tensile, durable type that is coated with polyurethane, and which makes it water repellent. Our 1680D Ballistic Nylon fabric is also used for a multitude of projects that require water repellent and mildew resistant features. The 1680D is an incredibly super-tough basket weaved synthetic material! 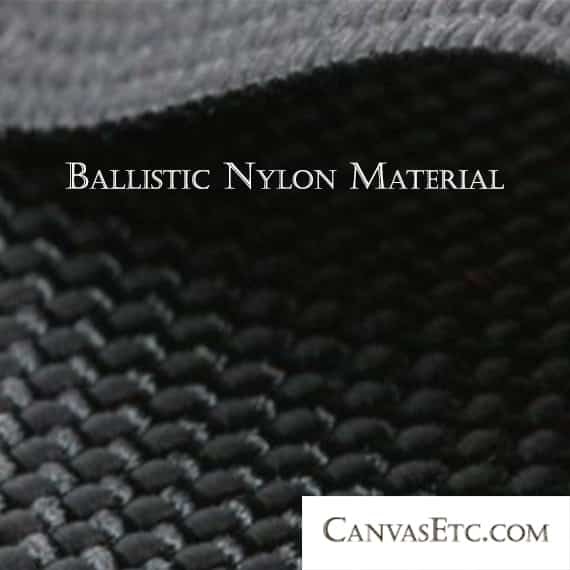 It goes without saying that if you are seeking a highly durable material and one of the most strong and functional fabrics, you would be well-served by this ballistic nylon option. 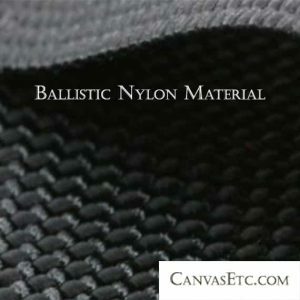 As Canvasetc.com offers a nice range of ballistic nylon at wholesale costs! If you are in need of a bulk order, please contact us directly at [email protected], or by phone – 404-514-7166.